The study, which will appear in an upcoming edition of Cognitive, Affective and Behavioral Neuroscience journal, shows that when people are forbidden from something, it takes on a new level of focus. The study’s most important finding, though, is that obsession is not as strong if others are also denied: when an object is forbidden to a group, the allure of the object drops dramatically. This helps to explain why group diet techniques such as Weight Watchers can be more successful than dieting alone. It also offers important insights for compulsive hoarding and parents seeking to help their children’s attachment to toys and other possessions. 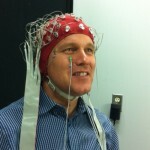 Brain imaging technology used in the study. For the study, groups of participants were shown images of everyday objects and told the objects were either theirs, someone else’s, forbidden to them or forbidden to everyone. Using electronic brain imaging and memory tests, researchers found the forbidden objects were recognized as well as self-owned objects. A version of the study, An unforgettable apple: Memory and attention for forbidden objects, can be viewed online or is available upon request. This news release was originally posted on UBC News by Basil Waugh, a member of the University of British Columbia Public Affairs office.